In 2001, after four decades of authoritarian rule, Indonesia underwent one of the most ambitious decentralization programs attempted anywhere over the past decade. Known as the "big bang," the reforms devolved political, administrative and economic power to smaller administrative units, and local actors took over management of municipal infrastructure and systems. While new planning structures are in place, authorities in many cities lack sufficent capacity to work with residents. Solo Kota Kita (SKK) — a group of urban planners, designers and non-governmental organization workers based in Surakarta (Solo) in Central Java — is trying to improve links between residents and the new decentralized structures. The group’s name comes from their first project in 2009, "Our City Solo," in which architecture students from the nearby Universitas Sebelas Maret created a database of socio-economic indicators for the city. Following a thorough methodological process, Solo's 51 neighborhoods were mapped and analyzed according to these indicators. 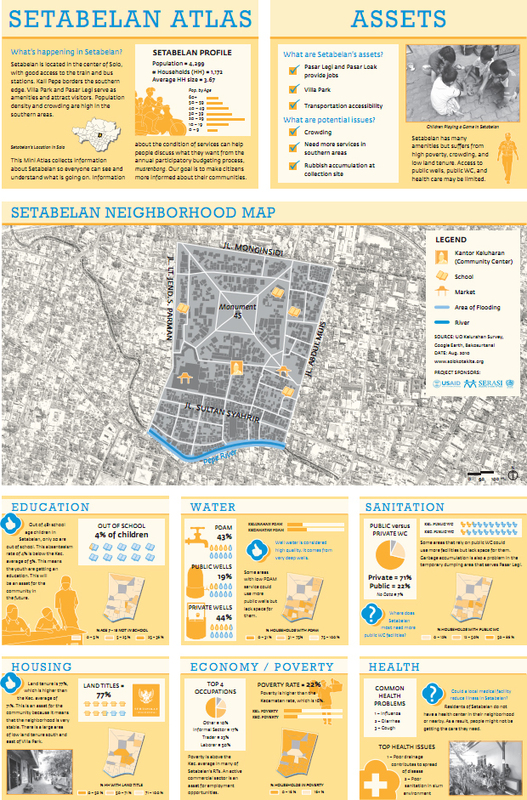 The group then produced neighborhood mini-atlases in Bahasa and English (pictured above) to illustrate the resources, assets and challenges of each area. These mini-atlases have been important tools for helping Solo’s residents take part in musrenbang, or participatory budgeting. 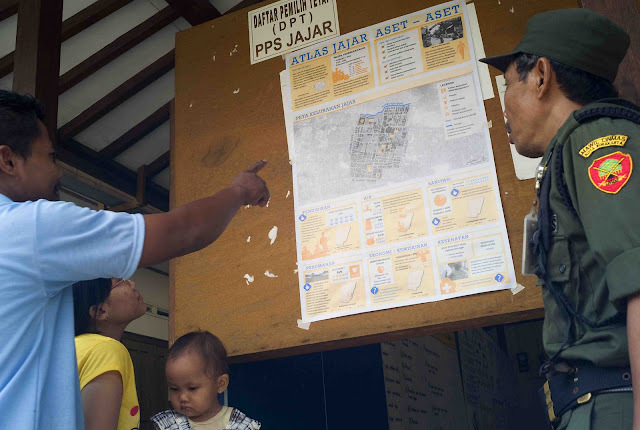 Part of the decentralization process, participatory budgeting happens at the neighborhood level in cities across Indonesia to allocate part of local budgets for small-scale neighborhood improvements. SKK found that the mini-atlases have been appropriated by residents in different ways. In one neighborhood affected by regular flooding, residents used maps showing the location of broken drainage to prioritize drains for renovation. Apart from allowing residents to target broken drains, the maps enabled discussion about the issue in a group setting. In another neighborhood, a women’s group used the mini-atlas to advocate that residents and the local government focus on education issues. Since this experience, SKK has been involved with participatory planning, design and development in various parts of Indonesia in partnership with UN-HABITAT and Mercy Corps. Their projects emphasize community-level planning, making links between local government and residents, and communicating urban issues in engaging ways.